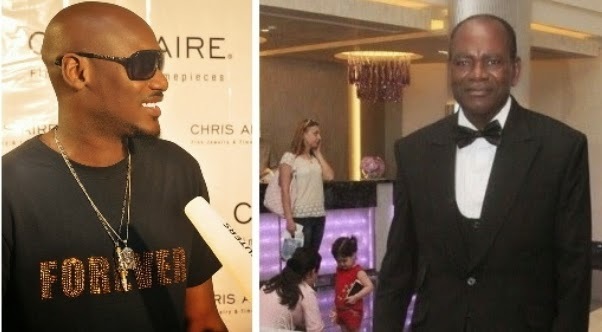 African queen crooner Tuface Idibia recently announced that his dad has been diagnosed with prostate cancer. This was made known at a cancer charity event that took place last week at Eko Hotels in Lagos state Nigeria. Sources close to the singer disclosed that his dad’s cancer is at its early stages. The 67-year-old father of the musician is reportedly set to begin chemotherapy treatment for cancer this month. On the 8th of June, 2014 at the event tagged Banquet of Stars against Cancer (BOSAC) Tuface was joined by other A-list Artistes and one of Africa’s greatest music Maestro, Sir Emeka Nwokedi, the conductor of the Lagos City Chorale in a performance by the Choir and Orchestra of the Musical Society of Nigeria (MUSON). The benefit event served as an opportunity to raise funds in support of the war against cancer in Nigeria. What a sad news! May God heal him. Is 2face dis dumb to expose confidential health issue? There’s nothing confidential about it. A lot of people die daily because they refuse to cry out for help. God will see u through sir.